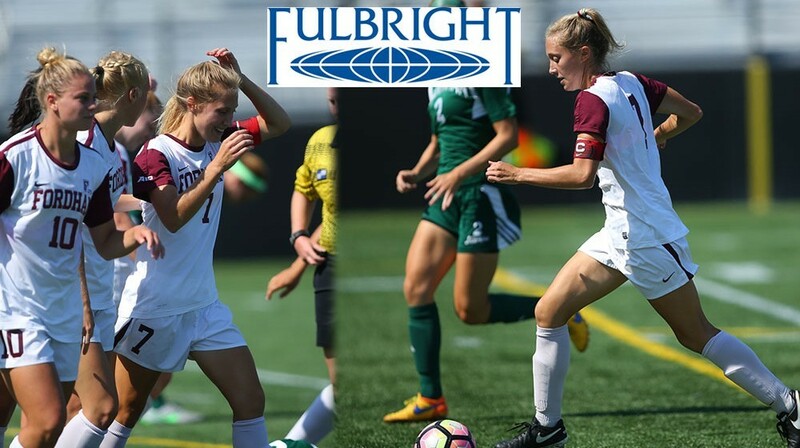 Bronx, N.Y. – (March 22, 2017) – Fordham women’s soccer senior Turner Block joined a very select group on Wednesday, as she received the prestigious Fulbright Scholarship and will be using it to study in Australia at the University of Queensland. Block, who just finished her four-year playing career with the women’s soccer team and served as a team captain this season, will be focusing her research the athletic identify formation of paralympic youth swimmers who have been diagnosed with cerebral palsy. Queensland is home to the only centre in the world committed to this type of research. The University of Queensland has partnered with the International Paralympic Committee to fund studies on the classification and development of para-athletes with physical impairments. Specifically, the School of Human Movement and Nutrition Science at the University of Queensland is the only place in existence that is capable of supporting this project. This is largely from the fact that Dr. Sean Tweedy, the Chair of the International Paralympic Classification Committee, is also Chief Investigator of the centre. Block will also be working alongside Dr. Eimear Enright, his partner investigator. “I am so incredibly humbled and grateful to have this opportunity abroad in Australia. I am such a strong proponent for athlete mental health and this grant allows me to give athletic identity formation the focus it deserves. Going forward, I am so excited to continue to work with athletes because being a student-athlete at Fordham has truly been the best experience,” said Block.Block’s project aims to understand the formation and impact of athletic identity in this population of elite youth swimmers. The sample size may be small, but the ramifications are widespread. In the future, this research on identity formation may help others who are disabled work through struggles with mental and physical challenges. The Fulbright U.S. Student Program is the largest U.S. exchange program offering opportunities for students and young professionals to undertake international graduate study, advanced research, university teaching, and primary and secondary school teaching worldwide. The program currently awards approximately 1,900 grants annually in all fields of study, and operates in more than 140 countries worldwide. Fulbright U.S. Student alumni populate a range of professions and include ambassadors, members of Congress, judges, heads of corporations, university presidents, journalists, artists, professors, and teachers.